Forget the holidays. What December is really about is your best nine Instagram posts. If you were on Instagram late last year, no doubt you saw a bunch of best nine Instagram posts from 2018. If you enter your Instagram ID on a dedicated app or site, you can see your nine most liked posts from the previous year. The collage the sites put together is, well – super Instagrammable, to say the least. But aside from being a fun way to look back on your best posts, 2017 best nine has a lot more uses. Read on to find out how you can use your best nine Instagram posts to get a little more insight into your follower’s minds! Before we begin, you should probably know where you can find your Instagram best nine. The best place to start is the app that began the craze, of course. As of 2018, the only drawback is that you’ll need to enter your e-mail to get your pictures instead of waiting for the site to load. But with wait times as long as up to one hour, that’s a pretty fair exchange! If you’ve got a private account, you’ll also need to use the app instead of the website. Our favorite alternative, though, is 2017bestnine.com. Don’t worry, it updates the years 🙂 You don’t need to enter an e-mail, and it doesn’t overload, resulting in long wait times. You can also post directly to Instagram from the site – a huge bonus! What Kind of Content Do Your Followers Like? This one might be kind of obvious, but one of the things your 2017 (or 18) Best Nine can show you is what kind of content performs best on your Instagram. My best nine Instagram posts, for example, were all posed portraits of me. That’s one of the least common types of picture I share on my Instagram! I’ll usually share travel photos or food, but not often fashion pictures or pictures of myself actually doing something. If we look at someone else, totally normal, like, say, Ariana Grande, we also get an idea of what performed well on HER Instagram. The singer was all over the tabloids last year with her engagement and subsequent calling off to Pete Davidson. Ariana Grande’s thank u, next promotional shots were the clear winner when it came to likes in 2018. Her tribute posts to ex Mac Miller after his tragic death were also popular. Your best nine Instagram posts is literally the perfect way to find out exactly what kind of content performs the best with your followers. I, for one, know I’ll be taking more portraits in 2019! Something else you can use your 2017 top nine for is finding out how many likes you got throughout the entire year on everything you’ve posted. 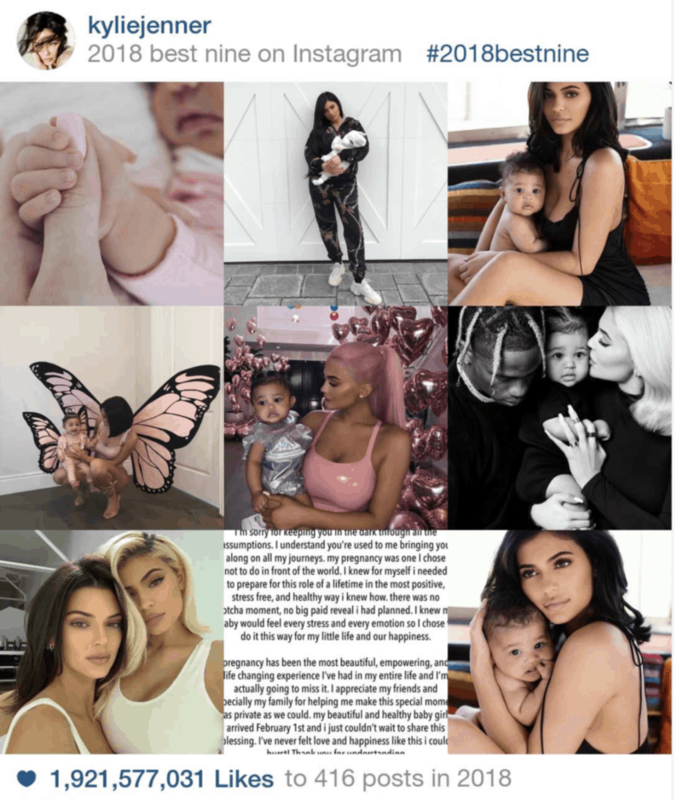 Kylie Jenner’s 1.9 million likes on 416 posts is a lot to compete with! But you probably don’t post as much as Kylie Jenner. That’s posting every single day – and more – in 2018. Most of us just don’t have that kind of time! 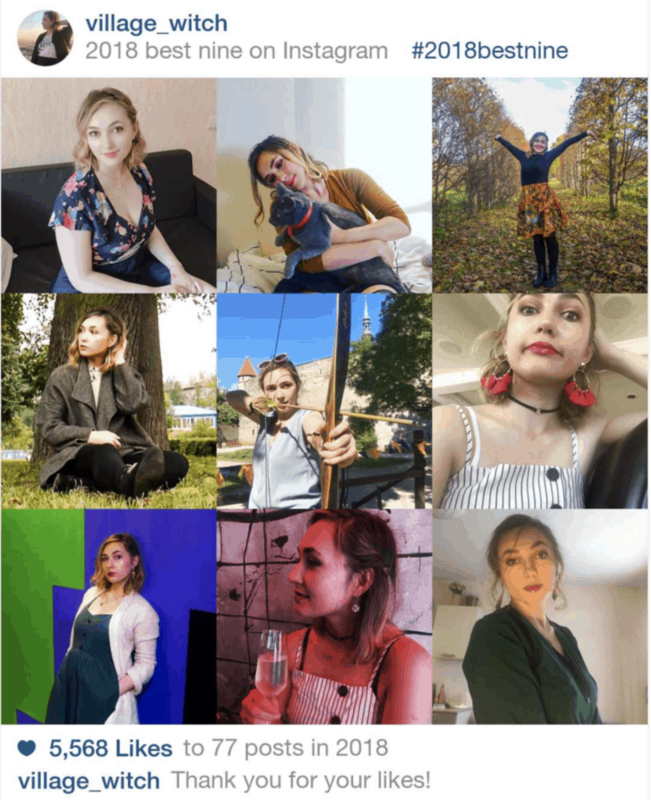 In contrast, I totaled about 5500 likes on 77 posts in 2018 – which is a bit more reasonable for posting! But if your likes aren’t where you want them to be, why not use that incentive to figure out how you can increase your likes? You can use your best nine Instagram posts to find other people to follow and engage with who make similar content. Your best nine Instagram posts are also a great way to find out what your followers like to look at. Finding your Instagram aesthetic is hard for a lot of people, but looking at your top nine can definitely help you find your groove. In my 2017 best nine, brightly colored pictures performed the best. 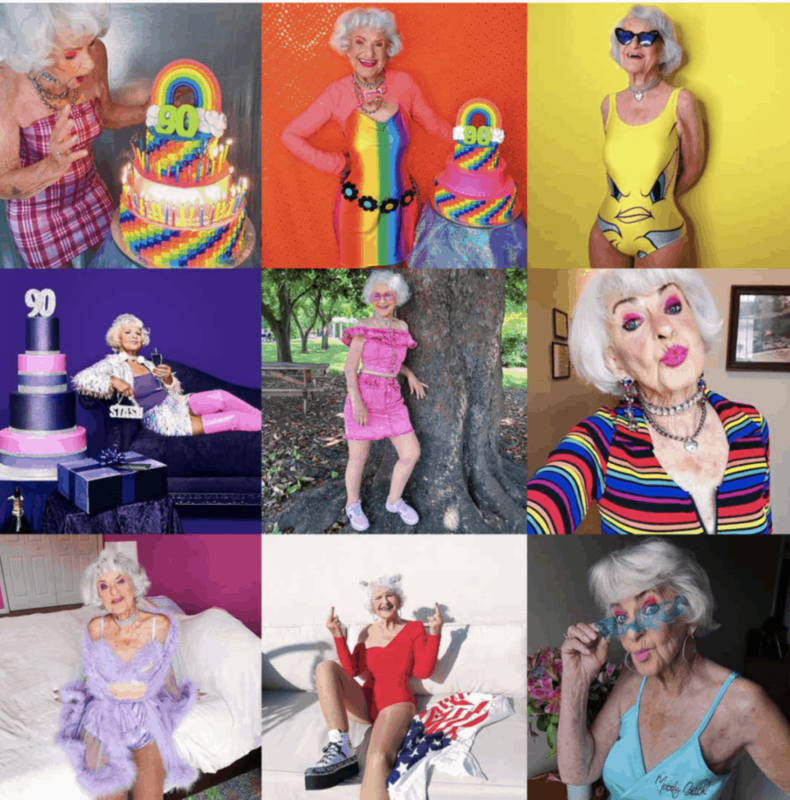 If we look at @baddiewinkle, she’s got a clear aesthetic going on. Her brightly colored, fun photos take the cake when it comes to likes. And they show off her killer fashion sense. If you’ve Instagrammed or saved your best nine Instagram posts from previous years, why not do a throwback using that post? You can do a #tbt, or even compare all of them together in a super collage. You can combine two Instagram trends – maybe even start a new one! Looking back is always popular on Instagram, so why not use it to your advantage? If you haven’t saved your best nine Instagram posts from previous years, don’t worry – there’s always time to start. What’s better than throwing back for yourself? Throwing back with all your followers, of course. Change it up and do a throwback week or challenge using your Instagram best nine. Recreate an old most-liked photo or collage. Encourage your followers to participate and reflect on their own best nine Instagram posts to come along with you on the journey. 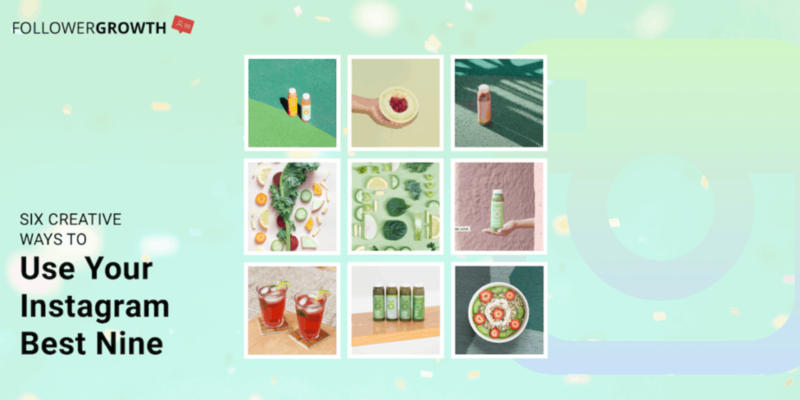 Everybody’s best nine Instagram posts are a great way to look at your collective growth – from your style to your followers. Letting your followers get in on the game only increases the fun. 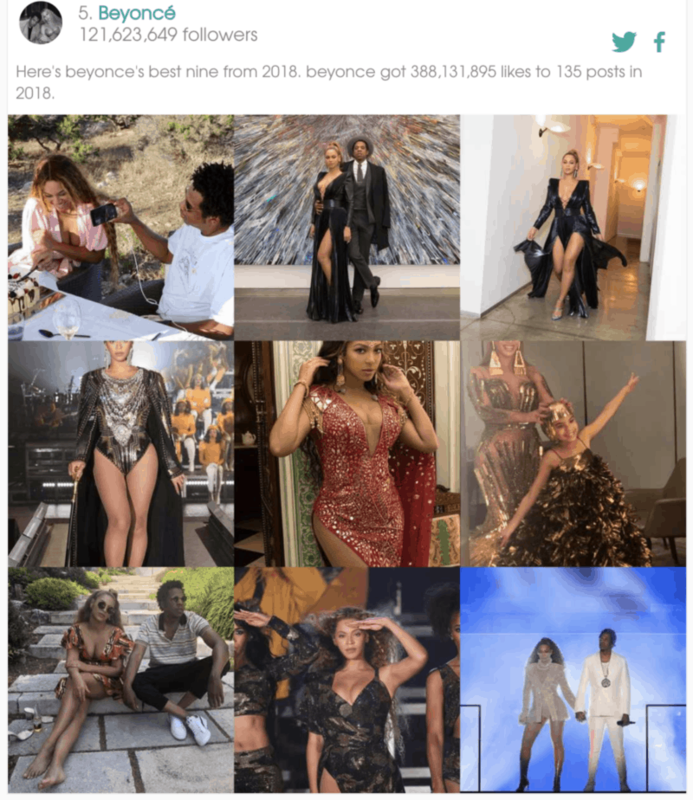 Another idea to use the app is to compare your top 9 to a celebrity’s best nine Instagram posts. Maybe it’s a celebrity you really admire, or one whose style you’re trying to emulate. Comparing yourself to a celebrity whose vibes you’re trying to channel can get you in on the trend, and appeal to both their followers and yours. Looking back at your best nine Instagram posts is a great way to get to know what kind of content your followers like. You can also see how well your likes performed. There are more ways to use your Instagram nine that just the one post, however! Get creative with it. Do a throwback or compare yourself to a celeb. Take the trend just one step further! Instagram best nine is a super fun trend that everyone looks forward to. If you ask me, the more ways you can find to use it, the better.